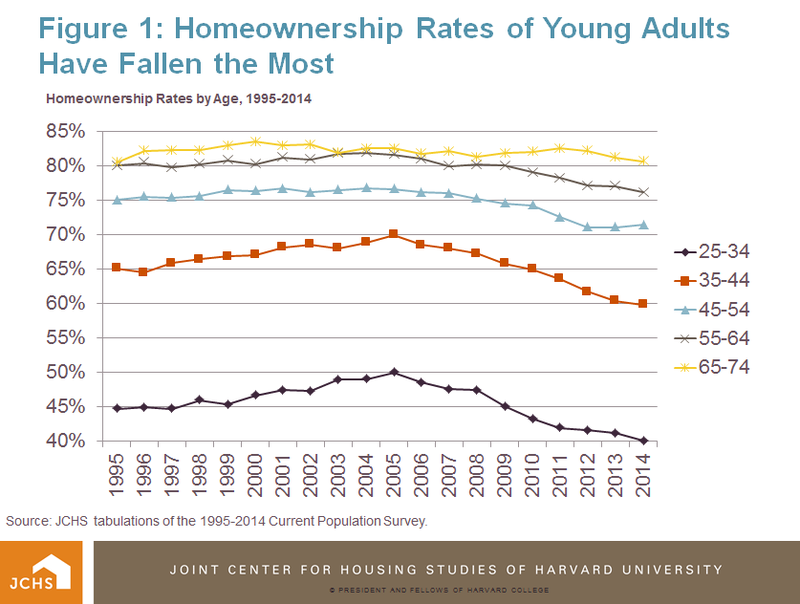 Housing Perspectives (from the Harvard Joint Center for Housing Studies): What is Driving the Decline in Homownership Among Young Adults, and What Can be Done About it? 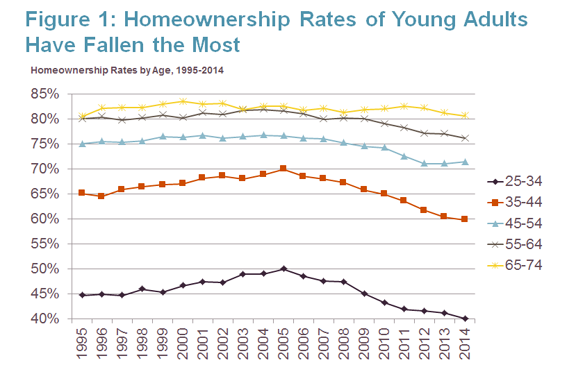 The homeownership rate for young adults ages 25 to 34, which rose from 45 percent in the mid-1990s to a high of 50 percent in 2004, fell to 40 percent as of last year, representing the largest percentage decline in homeownership of any age group over the last ten years (Figure 1). A large part of the reason for this decline was the adverse effect of the recession on the accessibility and appeal of homeownership for young adults, who make up the majority of first-time homebuyers. Yet recent events in the economy and housing markets do not tell the whole story, as longer-term socio-demographic changes among the young adult population have had an impact on their propensities for homeownership. Higher shares of minorities, lower rates of marriage and family formation, and increased focus on education and career development in the early years of adulthood have all contributed to fewer people buying homes in their 20s and early 30s. What is unknown, however, is the effect these trends have had on the fall in young adult homeownership rates during a period of economic distress. 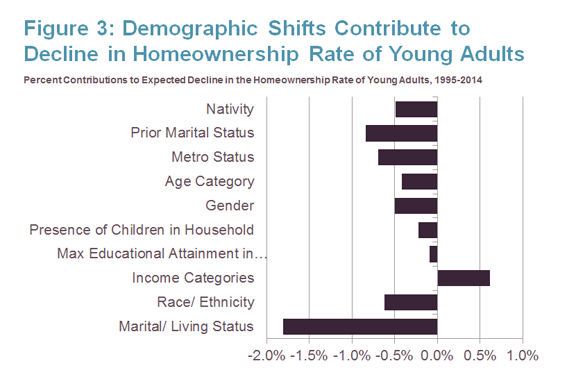 My new research paper decomposes these secular changes in the composition of young adults from the cyclical forces of the macro economy, and finds that absent changes in micro and macro market trends, demographic shifts alone should have actually lowered the homeownership rates of young adults slightly below their observed 2014 level of 40 percent. Source: Tabulations of the 1995-2014 Current Population Survey. The largest contributors to the expected decline in homeownership among young adults over the last two decades are smaller shares of married couples, higher shares of minorities and immigrants, and higher shares of young adult households living in center cities versus suburbs. As my previous blog post noted, marriage rates for young adults have been on a steady decline since the 1960s, as the age at first marriage has increased from 20 to 26 for women and 23 to 29 for men. As a result, the share of young adults ages 25 to 34 that have never been married increased from under 25 percent in 1983 to 35 percent at the turn of the century, to almost 50 percent in 2014. Among this age group, the combination of both fewer married couples, as well as fewer previously married individuals living in homes that were purchased with a former spouse, lowered their expected homeownership rate by 2.6 percentage points between 1995 and 2014. 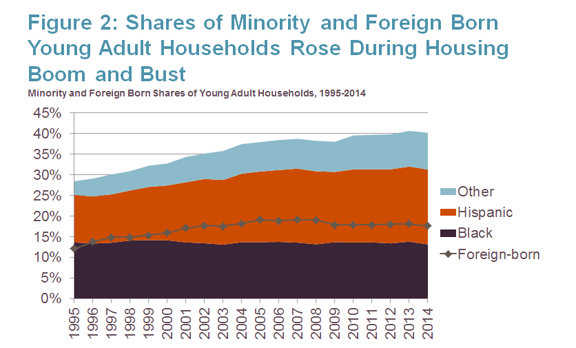 At the same time, the minority share of householders among young adults increased from 28 to over 40 percent, and the share of foreign-born households by 12 to 19 percent (Figure 2). Given that minority and foreign born households generally have lower homeownership rates than whites and native-born householders, these demographic shifts served to depress overall homeownership rates for the age group by an additional 1.1 percentage points during this period. Note: White young adult households are not shown in the chart and comprise the remainder of the distribution in each year. Whites, Blacks, and Others are non-Hispanic, while Hispanics may be of any race. Other includes Asians and multi-race categories. 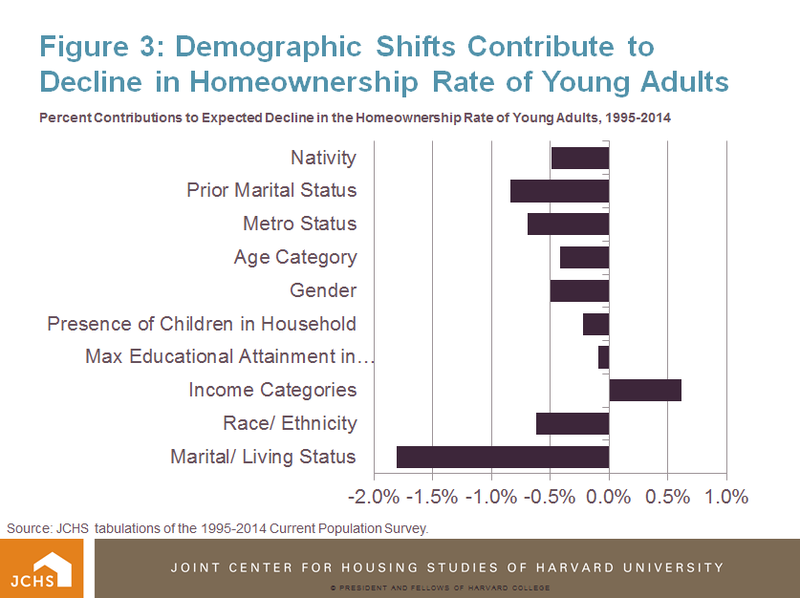 lowered expected homeownership rates of young adults by an additional 0.7 percentage points. Indeed, of all the socio-demographic changes modeled in this research, only a slight increase in the income profile of young adults had any positive effect on their expected homeownership rates over the last two decades (Figure 3). These results make clear several important facts about the role of socio-demographic factors in shaping recent homeownership rates among young adults. First, absent the dramatic swings in housing markets and macro-economic conditions, we would have expected young adult homeownership rates to be about 5.1 percentage points lower than in 1995, or at 39.6 percent, in 2014. This is only slightly below the actual rate of 40.1 percent. Second, much of that decline was driven by changes in the marital status and living arrangements of young adults, which was itself potentially influenced by the declining economy of that period. However, the model used to estimate the effect of demographic shifts on young adult homeownership rates only explains about 25 percent of the variation in tenure status across individual households. This suggests that these shifts play a minor role in determining homeownership rates, while factors not included in the analysis – namely macro-economic conditions and individual preferences for owning and renting housing – are have greater influence on the tenure outcomes of young adults.